"A passionate warning of the danger of converting the welfare state into the therapeutic state. Professor Szasz presents a subtle, learned and exhaustive enalysis of the difference between medical illness and mental illness and of the harm from confounding the one with the other." "Dr. Thomas Szasz is at it again, continuing his long quest to comfort the afflicted and afflict the comfortable. This time Szasz is attacking 'pharmacracy' as a totalitarian, politics-ridden, individual-responsibility-shunning 'Therapeutic State.' Whether you agree or disagree, and whether you are pleased or enraged, Szasz will provoke you into an increasingly rare modern activity: critical thought." To those who wonder what is Thomas Szasz's reponse to biological psychiatry, this book provides a devastating response. Pharmacracy will expand Szasz's reputation, as it includes a clear analysis of the definition and strategic rhetoric of the concepts of 'diagnosis,' 'disease,' and 'disability.'" "One expects Thomas Szasz's work to exhibit not only a high level of common sense, but a careful philosophical, analytic approach to the foundations of the problems addressed. 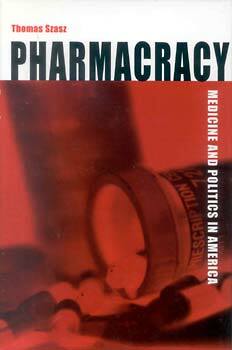 Pharmacracy meets and far exceeds that expectation: It is a very fine piece of work -- both enlightening and frightening." -- George Englebretsen, Professor of Philosophy, Bishop's University "No one has done more than Thomas Szasz to alert us to the menace of a government that regards all human conduct, no matter how private, as a matter of public health, and treats the citizenry as afflicted sheep in need of a coercive shepherd to provide for their rehabilitation." "An excellent and seminal book on the pervasive, intrusive, and dangerous power of government officials over our health. Comprehensive, lucid, and provocative, Pharmacracy shows why such power must be ended so that people can control their own lives and benefit from the competitive health-care process only possible when the rights of individuals are fully respected."